Many people love summer because that’s when they plan family vacations. But you don’t have to wait for extended time off from work to enjoy many of summer’s best hobbies and adventures. So before you let yourself settle into doing the same old summer activities you do every season, why not consider some new ones? Camping. Camping is one of the most popular summer adventures. Here in Florida, you have to prepare for the heat. Many Floridians will camp at state parks that have water as the featured attraction, like a natural spring or a spring-fed river. That way you can stay cool during the day in the water. Bring sunscreen and remember to reapply as needed. At the end of the day comes the mosquitos so have a supply of products to combat these pests. Lotions, sprays that contain DEET or Picaridin work well, and do air saturators, such as the Thermacell products. And then there’s the sometimes-oppressive heat and humidity. Stay hydrated and out of the sun as much as possible, dressing appropriately. And check out this easy DIY air conditioner you can use as a tent. Climbing. Who says you have to be outside to get a great workout? Climbing is another popular summer adventure because you can do it inside at a climbing gym. To a degree, these climbing gyms simulate being outside on a rock face, and they are gaining popularity across the nation, even here in Florida. So you don’t have to get sunburned and suffer in the heat. Fishing. Always a summer staple, fishing can be as active or passive as you want it to be. Again, remember to wear sunscreen and stay hydrated and appropriately dressed for the conditions. Remember to check the weather and your surroundings frequently. You don’t want to be caught out on the water when lightning is in the area. Paddle boarding. Not sure if surfing is quite your thing? Try paddle boarding instead! 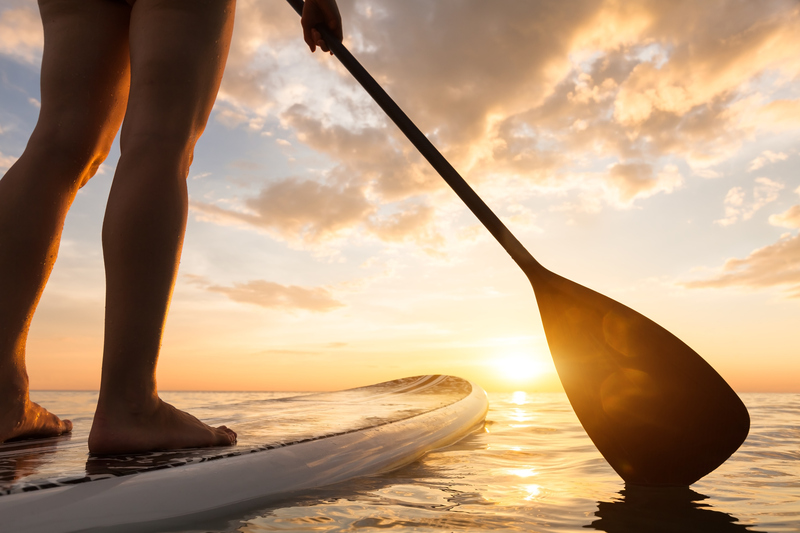 Paddleboarding can take you into great spots in very shallow water, including mangrove tunnels. And it provides a great core workout to boot. All you really need is a good board, a paddle, sunscreen, water and a proper PFD to have a great little adventure right before sunset. Hiking. Because of the sun and heat here in Florida, hiking remains an activity best done in the shade of the woods. But more often than not, you’ll find most folks hiking at the end of the day, right before sun up and right around sundown. That insect repellent will be needed in either case. Bill Jackson’s has all the adventure gear you need to make your summer an incredible experience. To learn more about our climbing gear, scuba gear, or paddling gear and more, contact Bill Jackson’s today.